Catastrophic weather is no longer a one-off event. How can we be better prepared? Popular opinion pointed to the 2014 Polar Vortex as a one-time event. The wind, ice, and snow brought by that harsh winter weather was responsible for $1.7 billion of the $2.3 billion in insured losses in the affected states that year, according to ISO’s Property Claim Services. Then Juno, the blizzard of 2015, struck. While not affecting as many communities as first predicted, the storm dumped up to two feet of snow and caused flooding in homes and businesses across New England. Once again, people are bracing for loss. It seems that again, the impossible happened. How can we predict the unpredictable and help our communities get back on their feet faster? One company doing this is Esri customer and partner Wall Street Network (WSN), located in New York City’s Financial District. 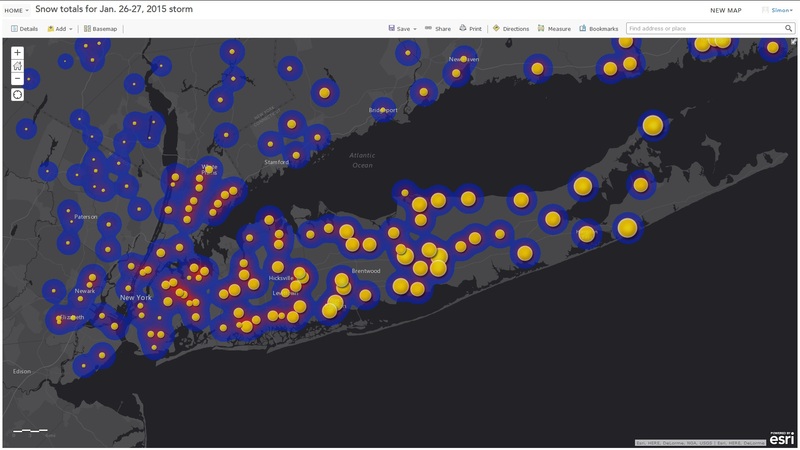 The company uses the ArcGIS platform to create solutions that help clients, including risk managers at insurance and financial service companies, view and analyze information in a geographic context. This helps them better understand their risk when an event happens. WSN staff has personal experience with catastrophic events, like many of their customers. They dealt with flooding and loss of power to their main offices from Superstorm Sandy in 2012. During that event, WSN engineers were able to continue helping their customers even when their main office was shut down. Like many organizations in the northeast, the travel restrictions enacted by state and local authorities, forced their staff to work from their respective home offices, nevertheless they continued to run models and create apps. When Juno hit, they were once again prepared. Understanding where snow accumulation was greatest during the Blizzard Juno helps organizations prioritize placement of resources. Many of WSN’s clients in the hard hit areas of Long Island, Connecticut, Rhode Island, and Massachusetts were interested in this insight. To find out, Pierre and his team turned to their ArcGIS online-based solution XtremeGIS to answer their questions. They were able to predict outcomes for clients using prepared datasets in their model, including Power Outage Return Period (which provides an estimate of the percentage of households without power based on wind speed), Forecasted Wind Speeds, Forecasted Wind Gusts, Accumulated Snowfall, and Accumulated Ice. The engineers at WSN then produced a risk index map at a county level scale for the Northeastern United States that rates each county on a scale of 1 (low risk) to 5 (high risk). 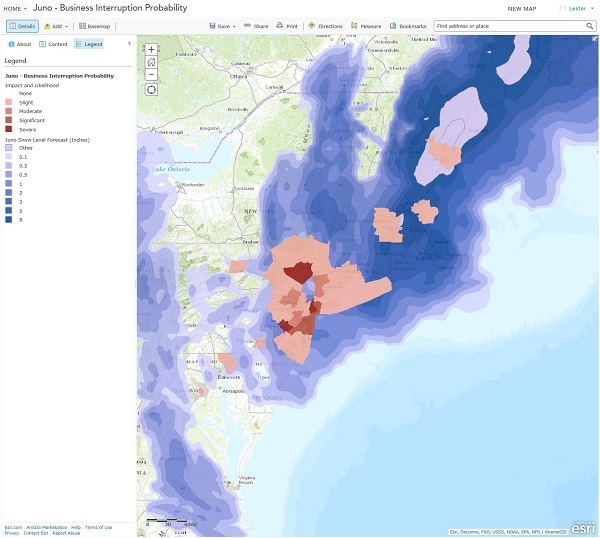 A map of anticipated business interruption for the areas hardest hit by Blizzard Juno, based on models by WSN. Understanding how weather will impact business can help companies recoup lost profits, and workers make up for lost wages. 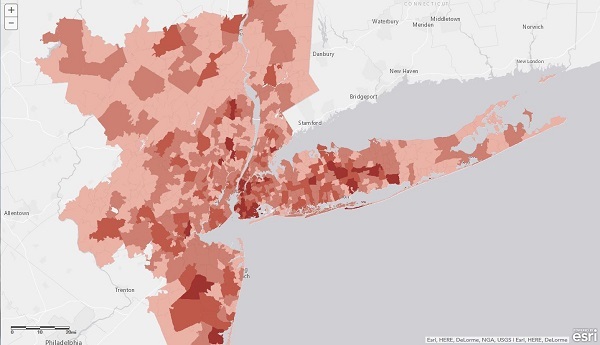 This interactive map shows the number of electronic and appliance stores per ZIP Code in New York City. It could help to determine where resources might be focused in an effort to keep commercial districts open during adverse conditions. View the map. Thankfully, according to Pierre, for most people, the event was more of a relaxing day off for many. However, the cost to tax payers and the loss of tax revenue for the areas called out in the storm track will play out in the coming months. With estimate models like those from WSN, businesses and communities can prepare and go into the storm knowing the outcome. Learn more about Esri solutions and how to take control of disruptive events at RAA’s Cat Risk Management 2015 in Orlando, Florida, February 10-12, 2015. Visit me at the show and see how spatial analysis can help you more accurately predict and prepare for catastrophe, provide the best service to your clients after an event, and understand your risk in the months to come.